For anyone interested in Bible study, nature, the environment or religion, this unique and valuable resource elucidates the connections between the Bible and Jewish tradition and the natural world. NOW ALSO AVAILABLE ON MACS RUNNING THE LATEST OS MAVERICKS. This book is for people interested in learning how the Bible intersects with environmental issues. Anyone studying the Bible, teaching about the environment, preparing Torah study, or encountering an unfamiliar biblical plant (whether on a hike in Israel or reading the weekly Torah portion) will find ample valuable material presented in an accessible manner. This book is unique in terms of its content. There are many wonderful books on religion and the environment. Some focus on environmental Jewish values, some are about plants and animals of the Bible. However, these two types of books do not reference each other. Books about nature in the Bible do not include material about consumerism, sustainability and stewardship. Books on Jewish environmental values never explain the symbolism of the pomegranate, or the connection between Sukkot’s Four Species and rain. It is as if there are two distinct and disconnected approaches relating Judaism to the natural world. In this volume, we have integrated these two approaches. We begin with a conceptual discussion, explore nature as symbol and its connection to the Jewish calendar, and end with an extensive resource on the actual flora of the (biblical) Land of Israel. Chapter One examines six religious environmental values, including consumption and sustainability, stewardship, our relationship with living creatures and God’s creation, and environmental justice. In this chapter we look at environmental issues through the lens of the Biblical text. In Chapter Two, we reverse our approach, and examine the Bible through the lens of nature: ten short essays explore the various possible meanings that the Bible and the Rabbis intended when they used the natural world (water, manna, milk and honey, specific animals and plants) as symbols and metaphors. Chapter Three explores how the Jewish calendar is connected to the natural cycle of time and specifically to the climate and the land of Israel, and includes essays on Shabbat and the holidays in each of the four seasons. Chapter Four is an encyclopedic guide to the elements of nature: sky, earth, water and plants. The plant guide is a comprehensive (100 page) reference to the plants of the Bible. All together these guides serve as a reference tool that supports the other essays that often link to specific plants. Chapter Five includes resource material: longer biblical and rabbinic texts and other miscellaneous material together with a hypertext-linked bibliography and webliography of Jewish environmental resources. 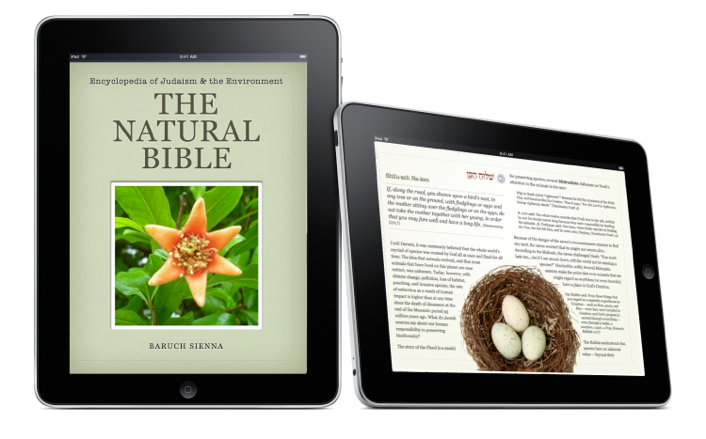 This iBook contains an extensive resource on the actual flora of the (biblical) Land of Israel and an encyclopedic guide to the elements of nature: sky, earth, water and plants. as well as other longer biblical and rabbinic texts and other Jewish environmental resources. This new iBook breaks new ground in the field of Jewish environmental studies and is now available for Bible students, nature lovers, and anyone concerned about the environment. Take it with you, highlight text, take notes and bookmark favorite passages. Search for specific text and tap the audio icon to hear Hebrew titles. Book contains a built-in glossary and index, multimedia and hypertext links. Baruch Sienna is an environmental Jewish educator, technologist and graphic designer. After many years of research, Mr. Sienna spent a full year in Israel, studying with environmental educator Dr. Jeremy Benstein, deputy director of the Heschel Center and working at Neot Kedumim, The Biblical Landscape Reserve in Israel. The environmental crisis is the defining issue of our age and we face enormous challenges. We believe that insights from our Jewish textual tradition can instill a respectful and reverent attitude towards the earth. Appreciating the natural world, in turn, helps us understand our sources and reconnect with Jewish tradition. We hope this book will be a guide for readers building the bridge between their religious tradition and the natural world. This site was created by Baruch Sienna of Aleph Technology.